"Who were Charlie Chaplin wives?" is a frequently asked question for the Edna site. Charlie had many loves starting with Hetty Ketty during his early London days. The young brunette would be the model for his ideal for the many years to come, but Hetty never became his wife. During Chaplin's early film years, Edna Purviance would become one of his loves. While he entertained serious thoughts of marriage, he also had doubts that he expressed in his 1964 'My Autobiography'. Edna also had her reservations as well. 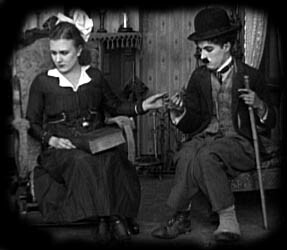 Edna Purviance will always be 'Chaplin's love and wife, in his movies', but was never Mrs. Chaplin in real life. Instead of marrying, they would remain life long friends. Who were Chaplin's wives in real life? Charlie's four wives were: Mildred Harris, Lita Grey, Paulette Goddard and Oona O'Neill. Chaplin's early marriages were rocky to say it kindly, but the last would be his best! And while there are questions whether Miss Goddard was officially Charlie's wife, she would play an important role as stepmother to Charlie and Lita Grey Chaplin's sons Charles Jr. and Sydney Chaplin. Hetty Kelly, sister of Mrs. Frank Gould, wife of the multimillionaire. Taken in America early 1911. She was heading back to England after a visit in America. From the ednapurviance.org research file. One night in the fall of 1908, Chaplin was working for Karno in London and was in the wings at the theatre watching the other acts on stage when his eyes met the eyes of one of the dancers on stage. He remembered her as a slim gazelle, with a shapely oval face, a bewitching full mouth, and beautiful teeth. She was a dancer and after she came off stage, she asked Charlie to hold a mirror for her. Her name was Hetty Kelly. Charlie was nineteen and Hetty was fifteen, but it was Charlie who was in love at first sight, not Hetty. Their short meeting led to a few dates that were mainly walks in London. But Hetty was not ready for a long-term relationship with Chaplin, and as quickly as they met, they parted. But Hetty would become the girl he would never forget. He would even create her in some of his classic films in later years. Hetty would set in his mind for a lifetime the look of his ideal girl. While Charlie had many loves, his first close serious relationship was with another girl whose eyes and smile captured him. In January of 1915, Chaplin was in San Francisco looking for a new leading lady. He had just arrived from Chicago after making his first film His New Job. He didnt like the Chicago winters, so moved to the Essanay Studios in Niles, California instead. San Francisco was about one hour northwest of Niles. He searched the local San Francisco theatres, with no luck in finding a girl. An Essanay associate suggested a girl he remembered as a regular at a local San Francisco café. This is the best known story on how this girl was found. The blond haired girl with the beautiful eyes was Nevada native Edna Purviance..
Edna Purviance was 19 years old, living and working in the Bay Area when she met Charlie Chaplin. Edna had been there since the summer of 1913 when she was 17 . Edna and her mother traveled to San Francisco many times, but on the last trip Edna's mother, Louise Nurnburger, returned to Lovelock alone, and Edna stayed to start her schooling at Heald Business College. Edna had many relatives in the Bay Area and business connections through her office work, so she enjoyed a variety of social events. There is a strong possibilty that Edna's social connections helped lead her to Chaplin, findings which I will publish in the future. Upon meeting Edna, Charlie was struck by her beautiful smile and eyes, but noticed a sadness about her. He signed her as his leading lady, even though he felt her too serious and sad for comedy. Edna was reportedly getting over a relationship at the time she met Chaplin, so she was quick in proving Chaplin wrong in thinking she was too serious for comedy. She had a delightful sense of humor, which Charlie adored. Working closely together on films during the next few months in the Bay area, the couple developed a friendship and bond with each other that would last a lifetime. In Edna, Charlie found a girl he could trust and could tell all his most personal desires and hopes for the future, as Edna would indicate in her letters to him years later. Edna was really Chaplin's first real close relationship with a woman since his earlier years with his mother. Edna came from a very strong family background with her mother Louise and her two sisters Bessie and Mrytle. Ednas mother was religious and all the girls were brought up through the church. Edna was also a good student and learned useful skills so she could always support herself, which Ednas mother wanted for all her daughters. And Louise raised all her daughters with an active social background. It can't be overestimated how important Chaplin's relationship with Edna was during this early time in his career. Having Edna as his love interest for his little tramp character added a sentimental side to his onscreen character that wasnt there in the Keystone Films. And there is no doubt the private relationship helped Chaplin deal with his shyness and relationships with other people. It has been written that Edna was like a mother to Charlie. 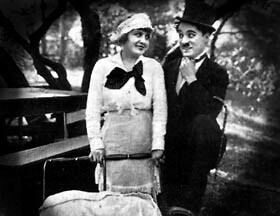 Charlie learned a lot from Edna, but everything was happening too fast for Chaplin, as his Essanay contract ended. The films he and Edna made during his year at Essanay were increasing his popularity. Signs the relationship was cooling came as early 1916, when Chaplin was in New York working on the Mutual deal with his brother Sydney Chaplin. Edna wanted to go to New York with Chaplin, but it was decided it was better for him to go alone. Edna returned to Lovelock during this time. I found her having some very nice parties as part of her first homecoming since signing with Chaplin. It was just before her homecoming that the people of Lovelock got to see Charlie and Edna on the screen for the first time. For nearly a full year, none of the Charlie and Edna's films appeared in Edna’s hometown of Lovelock in 1915. The rentals were just too hard for the local theatre to get. But in late January 'The Woman' arrived to delight her hometown friends and family. "There's Edna" could be heard simultaneously, as her friends and family saw her for the first time on screen and laughter filled the Lovelock theatre at Charlie's antics. Edna wasn't only writing to Chaplin, but also to the many fans who wanted photos of her. 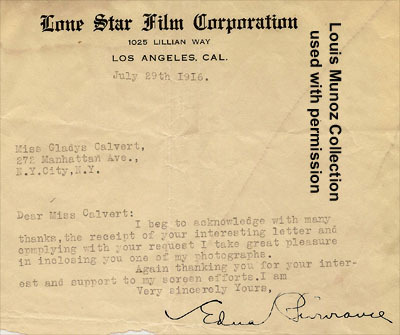 This letter was written while Edna work at the Lone Star studio for Mutual Films. From the Louis Munoz Collection - Used with permission. Edna wrote to Charlie in New York during this time. She was anxious to return to California and be with him, but she also asked if he was remaining faithful to her, which she had doubts he was. Charlie’s own book confirmed he wasn’t. Life was moving too fast for Chaplin, and Edna may have not been moving in the same direction he was. Edna wanted a serious relationship and a commitment. Charlie was looking at all the possiblies opening ahead. Their relationship foundered by the end of the Mutual Contract in 1917. Charlie and Edna tried to patch things up during a trip to Hawaii. Edna had a mature perspective about personal relationships through her sister, Myrtle, who got a divorce and her own mother who was divorced. She knew the relationship with Chaplin would not be a steady one. Chaplin was not ready to settle to be married and maybe Edna drew her own line on how far she would go in their relationship without commitment. In 1917 Edna made her move to date someone else, to which Chaplin quickly responded. Charlie didn't want to lose her, but also didn't want to commit. Their relationship was over. Edna and Charlie would remain lifelong friends, but I dont think either got totally over it, especially Edna. I think she always loved Charlie, and for Charlies part, he never forgot her. She was one of few people who got a fond mention in his autobiography. And in the long run, it probably worked out for the best. Special knowledgement to the books 'Chaplin, His Life and Art' by David Robinson, 'My Autobiography' by Charles Chaplin, 'My Life in Picture' by Charlie Chaplin, 'My Life with My Father' by Charles Chaplin Jr. and 'My Life With Charlie Chaplin' by Lita Grey Chaplin. Special thanks to Lisa Stein for the Edna Purviance 1915 picture. 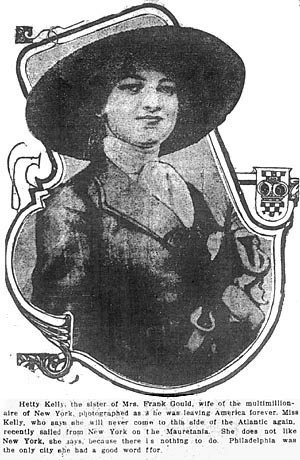 Picture of HETTY KELLY from the ednapurviance.org research file.